John Nimmo, EdD is Associate Professor, Early Childhood Education, in the Graduate School of Education at Portland State University, Oregon. From 2003 to 2013 he was Executive Director of the Child Study and Development Center and Associate Professor of Human Development and Family Studies at the University of New Hampshire. John was a recipient of the Social Justice Award and the Excellence through Diversity Award at UNH. In addition to presenting nationally and internationally for almost 30 years, he has been a visiting scholar at universities in Ghana and Australia. Formerly he was core faculty in teacher education and human development at Pacific Oaks College Northwest in Seattle. 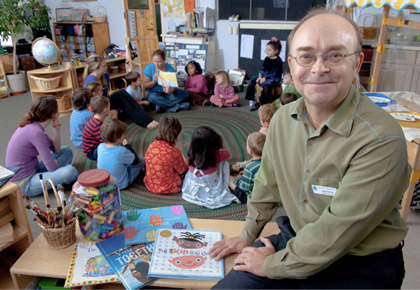 His publications include Loris Malaguzzi and the Teachers (with Carolyn Edwards & Lella Gandini), Leading Anti-Bias Early Childhood Programs, Emergent Curriculum (with Elizabeth Jones), chapters in The Hundred Languages of Children, as well as many articles. John’s research includes a study of collaboration and community in Reggio Emilia, Italy, research into young children’s participation in their community, and an international video documentary on children’s rights through the World Forum Foundation. He holds a doctorate from the University of Massachusetts at Amherst and was previously an early childhood and elementary teacher in his first home of Australia and in the United States.